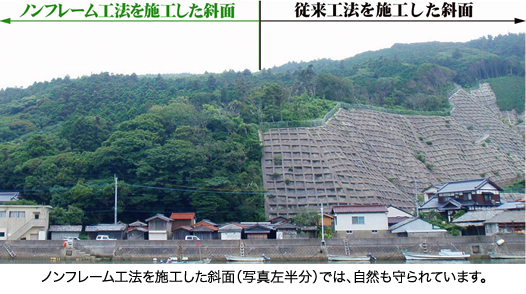 Conventional countermeasure measures were to cover the slope with a concrete structure and solidify it. 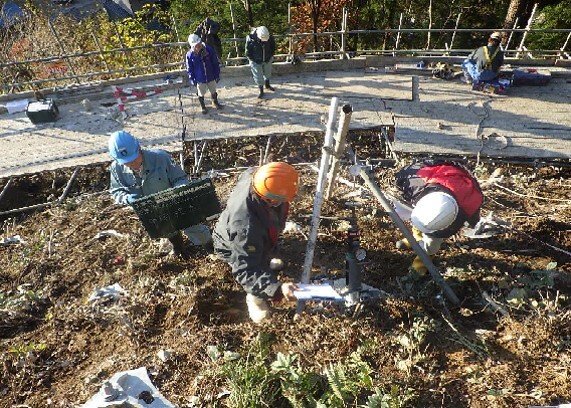 Drive a steel bar ( lock bolt) to a stable ground at a depth of about 2 to 3m in the ground attach an iron plate ( bearing plate) to the ground surface, and that hold down the fragile soil. Place this on the slope at intervals of 2m, and connect with the wire rope to protect the slope. 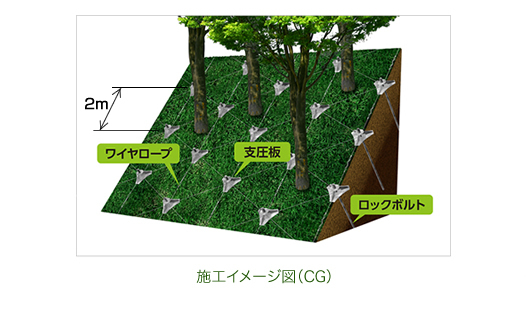 Since parts and construction method have been developed so that the slope can be constructed without deforestation. Therefore the original landscape and natural environment can be maintained even after construction. In comparison to conventional method of using a large amount of concrete , the Non-Frame construction method reduces CO2 emissions to about 60to 70%. In addition it contribute for the development of sustainable society by achieving sustainable resources saving. 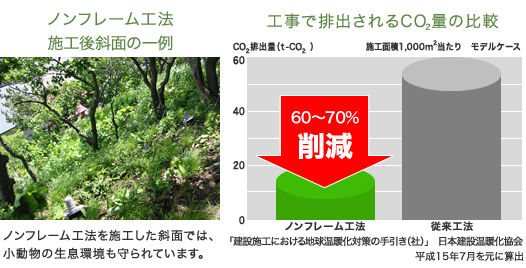 In the slope where the Non-Frame construction method was constructed(as shown below) , the natural environment is preserved even after construction and also protects the habitat of small animals living in the slope. The reduction of environmental impacts and its effects are highly appreciated and received commendation “Minister’s Prize W” for the ecofriendly construction method.